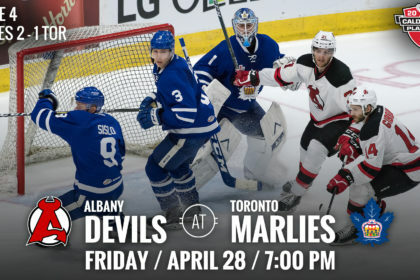 TORONTO — The Albany Devils and Toronto Marlies face off at 7 pm Friday for Game 4 at Ricoh Coliseum. 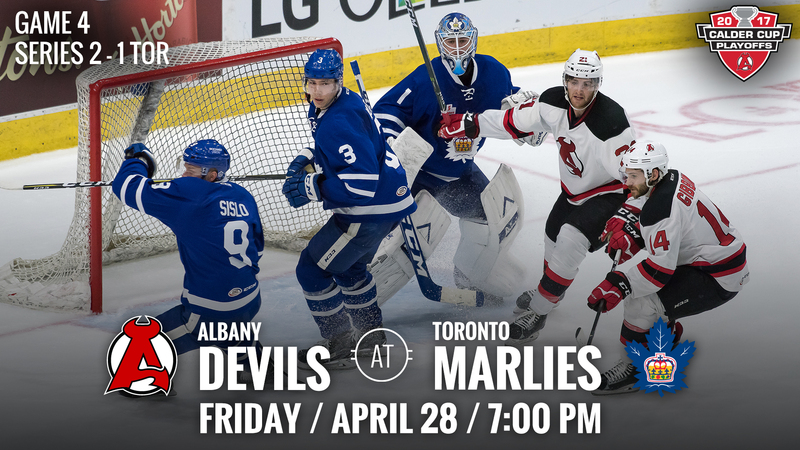 The Devils fell to the Marlies Wednesday in Game 3, 3-2, in overtime. 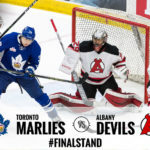 With the win, the Marlies pulled ahead in the best-of-five series 2-1. 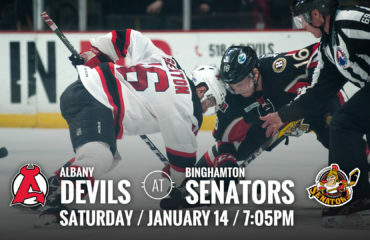 North Division Watch: The Syracuse Crunch and St. John’s IceCaps have faced off three times in their first round battle. 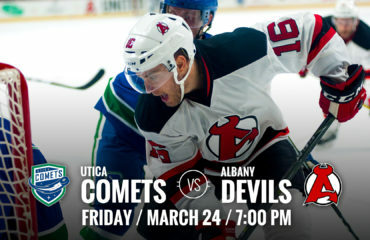 The Crunch currently lead the series, 2-1, after winning 3-2 Wednesday in Syracuse. 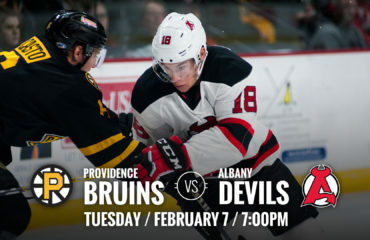 Like the Devils and Marlies, the two teams split Games 1 and 2, which were played in St. John’s. 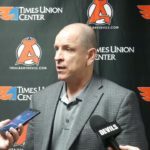 Goalie Watch: Mackenzie Blackwood has been the Devils netminder through the end of the regular season and the first round of the 2017 Calder Cup Playoffs thus far. 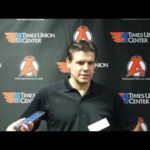 During Wednesday’s matchup, Scott Wedgewood backed up the rookie goalie, which marked his first time suiting up for a game since he suffered a shoulder injury on Nov. 25, 2016. 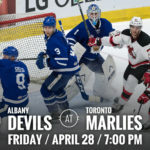 Elimination Game: When the Devils and Marlies face off Friday, it will be up to the Devils to pull out a win in order to stay alive in the Calder Cup playoff run. 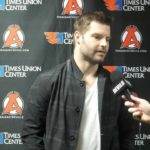 In the second round of the 2016 Calder Cup playoffs, the Devils forced a Game 7 against the Marlies, after being down 3-2 in the best-of-seven series and returning to Toronto for Games 6 and 7.